These afternoon workshops and field labs we will explore soils using handheld magnifiers and digital tools. Through hands-on steps, you will gain practical knowledge to examine your soil biota, gauge economic returns and improve your operation. Get into the soil pit and fields with Jimmy Emmons and other regional experts to put your new knowledge to use. LOCATION: McDonald Farm, 944 S. 8th Road, Douglas, NE 68344 (1/2 mile south of Douglas by the tents). This is a 105 acre field to build carbon & save moisture in traditional soils through new steps in southeast NE. Noon - 12:30 Registration and Check-in at field site for free materials for workshop. *Snacks provided but no lunch. Station 1: Soil Pit with Candy Thomas - Underground Rhizosphere: Let’s look at the roots, nutrients, carbon, and explore soil livestock. Use the magnifier to apply to your field. Station 2: Jimmy Emmons - Let’s Investigate the Above Ground Biomass and Nutrient Enhancement to Increase Returns: plant tissue, nutrients, weeds, pollinators and BRIX. 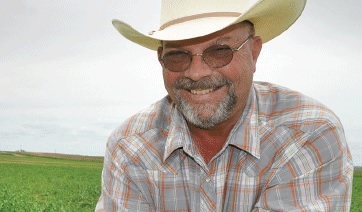 3:30 - 4:15 PM Tie Carbon, Nutrients and Health - Jimmy Emmons and local producers - next steps forward.